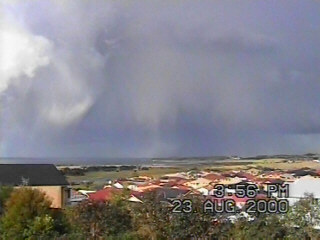 Unusual weather patterns affected the South East of Australia during the 24th August 2000. A large slow moving low pressure system was located over Victoria and southern New South Wales, also unusual was the broad area covered by the low. 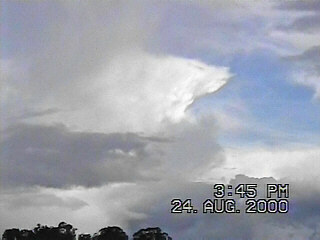 Cold air in the middle to upper levels also aided the development of many short lived thundery cells. The weather for the Illawarra on both the 23rd and 24th was almost identical, cool sunny mornings with building cumulus late morning and the first cells glaciating around 1pm. The cold air saw the small cells glaciate at very low levels, storm tops would have been lucky to better 30,000ft. The cold air ensured that many of the cells contained large amounts of very small hail. On the 23rd hail was recorded at Albion Park and Minnamurra, just south of Wollongong. On the 24th the storms were slower moving so I took the drive up Macquarie Pass and onto the Southern Highlands. There were several small cells in all directions, but finding roads to position myself under fresh growth bases was difficult. 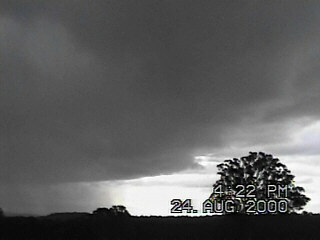 In the end I opted for a storm to the NW of Moss Vale. I caught this storm at the small town of Hill Top where lots of small hail was falling. 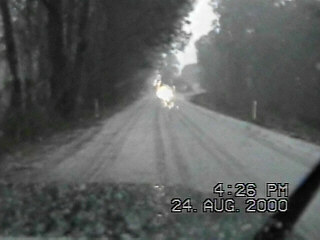 I later learnt that this hail led traffic chaos on the nearby Hume Hwy. 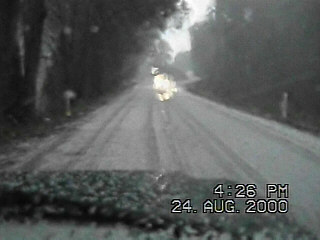 Certainly the hail was deep enough to cause a dangerous traffic hazard. Image below courtesy of Bureau of Meteorology. Note the broad low pressure system just off SE Australia. There was several smaller 'satellite' lows within this broad area. Also note the unusual placement of high pressure at 50'S, extraordinary for winter. This high acted to block the normal rapid SE movement of the low.